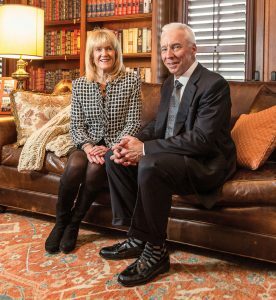 At its 32nd annual Cincinnatians of the Year Gala, JDRF Southwest Ohio Chapter will honor Dave and Kim Dougherty. Nearly 900 supporters are expected for the benefit that helps fund research on type 1 diabetes. Last year’s gala raised $1.2 million. Honoree Dave Dougherty is a Procter & Gamble alumni and CEO of Education at Work, a nonprofit he founded in 2012. He serves on the board of JDRF, led the 2010 greater Cincinnati United Way campaign and served as interim executive director of the Cincinnati USA Partnership. Kim Dougherty worked as an exercise specialist at Jewish Hospital. “Kim and I are grateful to be honored as the Cincinnatians of the Year for a cause that is so close to our hearts. Having been diagnosed with type 1 diabetes in 2014, I know how important it is that we find a cure. We are proud to be part of the Cincinnati community, where the people are so passionate about fundraising and helping others,” said Dave Dougherty. With a theme of “Happily Ever After…The Story of a Cure,” the event will transport guests through classic fairy tales to find the “story of a cure.” The gala will begin with cocktails and a silent auction. For the main event, guests will enjoy a three-course gourmet dinner, program and live auction. Event chairs are Susan Mustian and Lara Cramer. An after-party, beginning at 10 p.m., will feature live music from The Naked Karate Girls, mixes by DJ Etrayn, specialty cocktails, hors d’oeuvres and a coffee bar. Tickets are $250 for the gala and $55 for the after-party. Young professionals may buy discounted tickets for the after-party.